I hope everyone finds this helpful in these uncertain times.This Almanac was from a year or more ago, so things've been distressing at the pump for a while. Like I have to tell you that. But I do wonder about the employee who changes the prices on the gas station sign. Does he do it late, under cover of darkness? It can't be a happy task and it's likely dangerous if done too publicly. The enjoyable part of this cartoon is that I like drawing cars, or at least what pass for cars in the cartoons I draw. 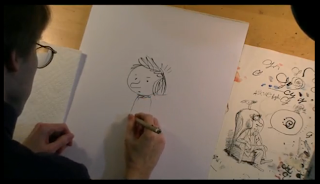 Editorial cartoonist Mike Lester, who can draw anything, passed along an insight into drawing cartoons from Arnold Roth; he draws not a car but his idea of a car, and so never has to go looking at reference photos or any of that nonsense. That's where the freedom of a cartoonist lies, in creating his or her anti-platonic ideal, and that's why I secretly pity those who draw realistically, because they're stuck with reality. I used to try that and it's too hard. Like most people trapped in a car for an extended period, we listen to books on CD during our car trips. We've done all of Harry Potter, the Hobbit, some Jane Austen (my wife's favorite), some Terry Pratchett (the Wee Free Men was especially good) and a hilarious series for girls from England called the Confessions of Georgia Nicolson. And we'll sometimes toss in a musical, most often Monty Python & the Holy Grail, the Producers, Sweeny Todd and Candide (if my daughters become antisocial misfits it may be traceable to these). In years gone by we went through lots of Sesame Street and Disney and an inscrutable series called "Dinosaur Mysteries", over and over and over. When I was a kid we were lucky if we could get a station on the car radio that lasted for more than ten miles. 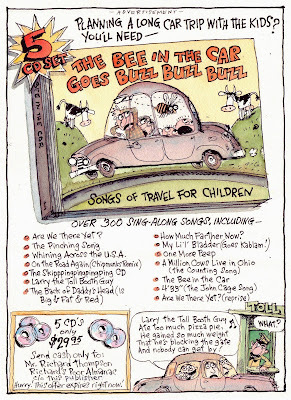 As Cul de Sac has been featuring lightning bugs this week this old Almanac seemed timely. And as you can see, lightning bugs are pretty controversial, perhaps the most controversial bioluminescent insect around these days. Like, are they called "lightning bugs" or "fireflies", and is that a matter of regional nomenclature or what? My email correspondent cartoonist Teresa Dowlatshahi first raised this question and I don't know the answer. Around the part of Maryland, DC & Virginia that I've lived in it's always been "lightning bugs", which sounds more impressively oxymoronic though less poetic than "fireflies". To settle which is correct I've started another pointless poll on the right of this page. Though considering that the last poll, about putting CdS in the daily Wash Post, was barely launched before the Post did just that makes me think that maybe these polls are more powerful than I'd assumed. 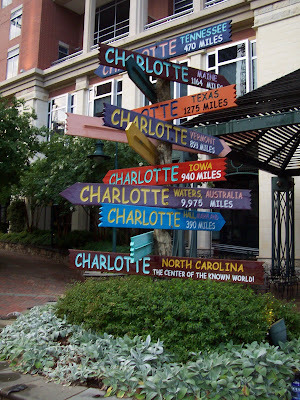 If you were to turn 180 degrees from the multiple-Charlotte sign in the photo posted below, you would see this. It's the greenspace with the outdoor performance of Romeo and Juliet, behind which is a fountain with three large sculpted fish. The red brick building behind the fountain is part of St. Peter's Catholic Church. In the 1930s that building was the Catholic Home, an orphanage, and for a time my Mom and her two sisters lived there, in the dormitory in the attic. If you were to step slightly back now, and to your right, you'd see this. 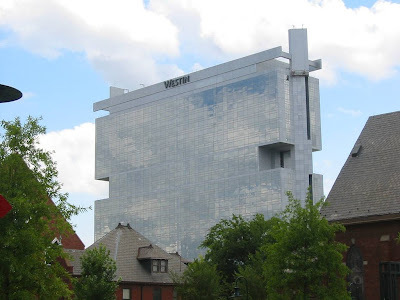 It's the Westin Hotel next to the Convention Center, where I stayed. The gabled roof below it is the old Catholic Home. My Mom's life had enough drama and coincidence to fill a novel by Dickens, but it also had a good deal of comedy in it. I think she'd be tickled to know I visited her old neighborhood 70 years later and stayed in a fancy hotel, and saw some Shakespeare right outside her old window. I'm back from Charlotte, North Carolina, Center of the Known World and Home to the Friendliest Comics Convention Hosts in the Known Universe. The sign above was one of several in a charming literary-themed park near the hotel where we wandered on Saturday evening. My daughter's name is Charlotte, so I took this photo to show her how widespread her influence is. 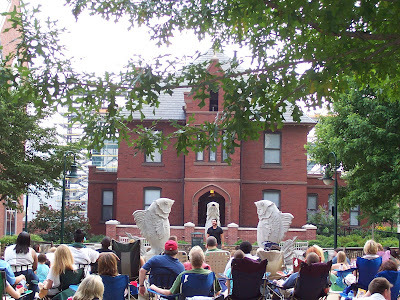 There was a free outdoor performance of Romeo & Juliet on the greenspace in the center of the park, and at the park's edge, on College Street in front of the Convention Center, there was a parade of fancy cars from the car show that had shared the Center with HeroesCon. If you stood in the right spot you could watch and enjoy both, though comprehend neither. We got home yesterday to a sudden storm with a vivid double rainbow, and the news that Cul de Sac is now in the Wash Post every day, in the spot where the late & lamented Single and Looking once stood. More TK once I catch up on stuff. This is being posted from Prof. Craig Fischer's hotel computer in Charlotte NC, the Queen City of the South. Not much to say, except thank you to the dozen or so people who showed up to hear me bloviate at the panel on Friday. I'd do a shout out by name, but I might miss somebody and I'd feel bad. HeroesCon has been a hoot, and the people running it are excellent hosts. More TK, as they say in newspaperese. I'll be away till Monday night, so youall have fun, and please leave a joke, riddle or amusing anecdote in the comments section. Then if you still need entertainment go visit one of the nice links I've arranged for you in the right hand column. And if you feel you need to preorder a Cul de Sac book, please avail yourself of the link also to your right. Those who do will note an interesting addition to the Editorial Review section of the Amazon page; the book's complete foreword by Mr. Bill Watterson. Made me blush so hard I got a nosebleed. And while I'm away check in at Heroescon just to see if any fresh embarrassing photos show up. 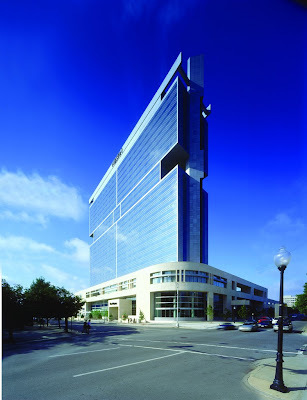 This is where I'll be for the next four or five days, at the Westin Hotel in Charlotte NC. Some cool looking building, huh? I understand it unfolds into a giant robot if you push the big red button on the room phone. ComicsDC . Okay, I'm more acompanying him, as we're taking his car, and he'll probably do most of the driving. So it's a road trip! I'll let you know how it goes and there'll be photos to show too, because we'll take his camera. I haven't been down to Charlotte in almost 25 years, though my Mom was born there and I had a number of relatives around town, and we'd visit once a year. 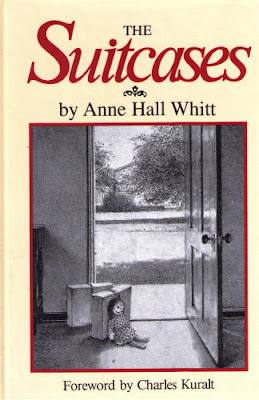 My Mom even wrote a book, The Suitcases , about her childhood there and in the Blue Ridge Mountains of North Carolina. I think Charlotte may have changed some since then. The following is a repeat from October 8th, coincidentally my birthday. I offer it again because first, it deals with important issues that I as a cartoonist face daily; second, because when you google-image search "Hunt Imperial nib" this post shows up first; and third, because I'm going outta town on Thursday and I'm scrambling and this is all I got. But I've updated it some with useful information. Ooh, lookit that baby! 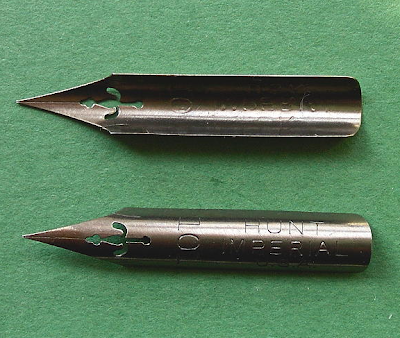 The Hunt #101 Imperial nib, excellent for penmanship, copperplate calligraphy, ornamental work and funny cartoons. With its dual shoulder slits, fleur de lys vent hole, compass, and this thing in the stock that tells time, it's a cartoonist's best friend. Unless, of course, the tip is a little bit askew or there's something wrong with the tines, or it's got a little schmutz in the main slit, in which case it's an evil, twisted, deceitful little monster who'll screw up every drawing it puts its point to, dribble ink down the sheet and break your heart. And you know what the difference between a good nib and a bad one is? It's microscopic! You can't see it! But you'll know it the instant you put the nib to paper. And don't get me started on brushes. Update: how to give yourself an inadvertant jailhouse tattoo. Here's my method. I draw something in pen & ink and screw it up somehow, and this makes me pointlessly mad. So I take the still ink-loaded nib pen in my right, or drawing, hand, and jam it into the papere towel I keep in my left, or non-drawing, hand. And I do it a little too hard, so that the still ink-loaded nib goes a good quarter inch into my left palm. This leaves a small permanent mark, which could be called an idiot's stigmata. I got mine about 17 years ago and it's still vivid, and whenever there's a lull in the conversation I'll show it off. 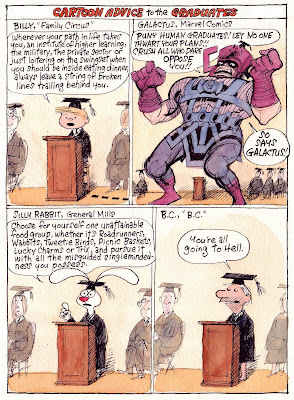 I know at least two other cartoonists/illustrators who have something similar. Which only proves that cartoonist/illustrators are likely to get pointlessly mad at inanimate objects when they screw up a drawing. And per a previous comment; I feel that "nib" is short for something, like "nibben" or "nibboleth". Discuss among yourselves. Winner as always will have his/her comment published in a popular blog of my choosing. Despite the fact that the National Gallery has the only painting by Leonardo da Vinci in America, the dish-faced Ginevra de'Benci, as well as slew of wonderful Degas (my favorite artist by far), Vermeers (3 1/2, including the perfect Red Hat) and caricature busts by Daumier (the whole Legislative Belly); despite all that, the National Gallery painting that first made an impression on me is the one with the shark in it. It's called Watson and the Shark and it's by John Singleton Copley and it scares the pants off every kid who sees it, in an enjoyable kind of way. 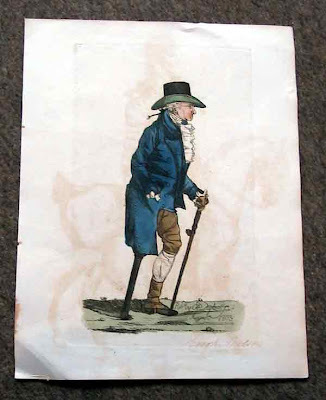 Brooke Watson, here depicted getting his foot chewed off, later became a wealthy London merchant and eventually Lord Mayor of London, and he bragged about his shark misadventure incessantly, even featuring a disembodied foot on his coat of arms. His political opponents circulated a snarky rhyme about how much he would've been improved if the shark had gotten his head instead. He sounds insufferable. But he commissioned this painting, beloved by schoolchildren all over DC. 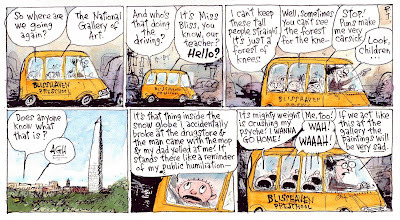 I also remember going to the National Gallery back in the early 60s, when the Mona Lisa came to town. My mom and I stood in line forever, eventually entering a long room hung with deep red velvet curtains, and on the far wall there she was, large as life and twice as natural. 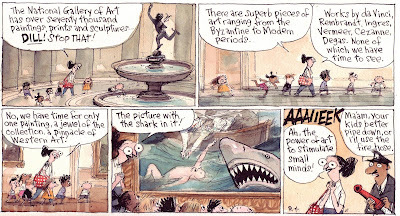 I'd remember it even more vividly if Leonardo had somehow worked a shark into his composition. UPDATE: In an almost unbelievable bit of harmonic convergence, my wife has this drawing of Brooke Watson on the computer desktop. She's doing an Art Ace class today at the elementary school, where a parent volunteer comes in and talks about an artist or arwork and the class does a little project based on it. And today by golly she's doing Watson and the Shark. I didn't know about this till after I'd started posting this series. I see the Hand of Fate in this; or maybe the Foot. 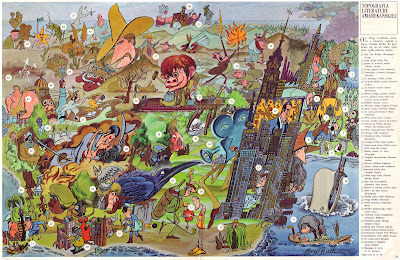 Here's the final color Keith Olberman that appears in the New Yorker this week. It's the third sketch put on a lightbox and transferred to Arches 140 lb. cold press watercolor paper, stretched on a board (that's the fun part because I get to dunk it in the kitchen sink) and watercolored (but not over-watercolored). I think it came out fine, though the microphone doesn't stand out enough from his stripey shirt. 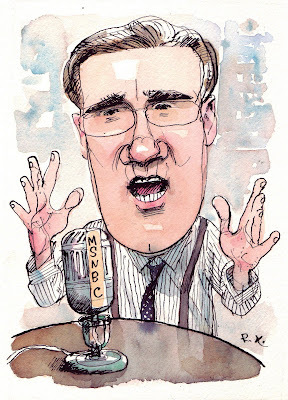 But if you want to see somebody who knows how to do this more deftly and with more interesting color, go look up John Cuneo and Barry Blitt. And please rush out now and buy a copy of the New Yorker, and one for your father, too. Finally, we get to some Art. 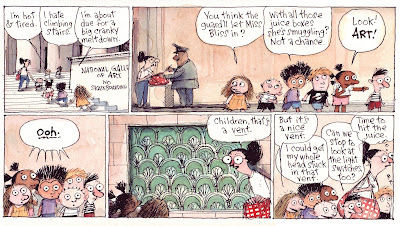 I remember going down to the Nat Gal with a little dinky sketchbook and drawing the vent. Drawing in public always makes me antsy for some no-good reason. After this ran in the Post Mag I got a note from a woman who'd been at docent at the Gallery, saying how little kids always noticed the fancy vents and would always stick their hands in them. I know I did when I went down there on field trips as a kid. It's one of the things you do growing up in the Capitol of the Free World. Here's the third bit, from exactly four years ago yesterday. Notice how young and not-well-drawn everybody looks. Note for those not from DC, there's a merry-go-round on the Mall, right outside the Arts & Industies Building, down from the Smithsonian Castle. Here's a lovely piece of writing by Shaenon K. Garrity, who was there. Thanks to Mike Lynch, who pointed this out first. I'm sure there are laws against filling a minivan with preschoolers and letting their teacher drive them, but I chose to ignore them because I'm such a rebel. 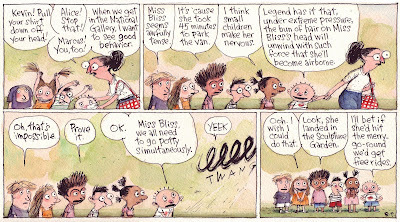 As Here Today Gone Tomorrow noted in a previous comment, here we witness the beginnings of Miss Bliss's mental breakdown, the very sowing of the seeds of madness. But it probably started much earlier, as it was once mentioned that Petey attended Blisshaven Preschool too. This is what I was working on last night, a caricature of Keith Oberman for the New Yorker. In the first he's yelling out of his fourth floor Rockefeller Center office (shades of "Network") and in the second he's posing like Edward R. Murrow with a giant microphone. In the end we combined the two sketches and revved up Olberman's pose into something more manic. Then I did a watercolor final, emailed it and went to bed, before dawn even. Both of these are fast ink sketches on semi-translucent paper, so I can slipsheet them and rework them by semi-tracing. It's my favorite way to work, fast and dirty, and I wish I could always work like this. This was the beginning of the first field trip I sent the Blisshaven class on, back in '04. I'll post the next four or five strips in the series over the next few days. It was also the first multi-part story, or "story arc" as those in the know call it, though it pretty much led nowhere. Except to the National Gallery, where the floors are slippery. Long as everyone is making beach plans, here's a bit from the Otterloop's first trip to the beach, in '04. I grew up going to the Maryland beaches Rehobeth, Cape May & Bethany Beach, with side trips to Ocean City for some more raucous fun. Actually, way back in the '60s we'd go to Atlantic City, when it was an elegant place with older hotels and the boardwalk had little trams full of old ladies in hats and white gloves. That's about my speed these days, without the white gloves. But here the Otterloops are visiting Geek's Neck, which seems to be like Ocean City with the volume turned down. 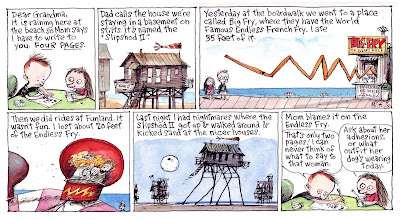 I think the Big Fry place is a good idea; if there were a franchise available I'd buy one. This illustrated a piece in the Post Magazine last year about a couple who hired a contractor to work on their house. The contractor they hired was a dead-ringer for Joseph Stalin, with an attitude to match. None of the contractors I've seen in our neighborhood have resembled world-class dictators, though one working down the street could pass for Huey Long. And we once hired a plumber who looked so much like Mickey Dolenz that I almost asked him to sing I'm a Believer just to see if it was really him, working under a pseudonym. This is from last summer. We've got a beach house lined up in Duck, NC, on the Outer Banks. 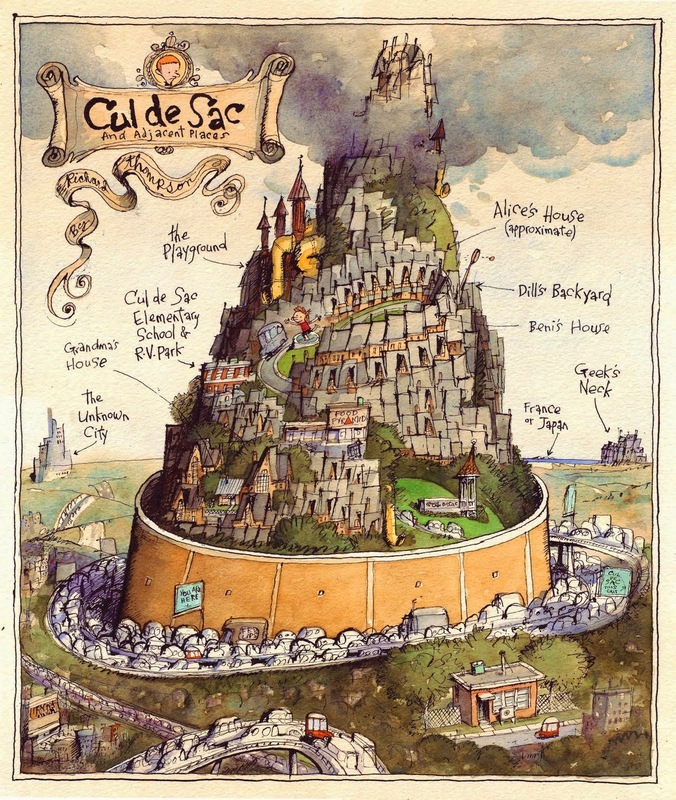 Usually we have four to six people, but this year it'll be a dozen or more, so we're getting one of those large, Gormenghast-size houses, with all the bedrooms, bells & whistles. Nothing too overbearing or decadent, but it does have a swimming pool. I can't do the beach stuff like I used to, having overdone it some in my youth I'm advised to avoid all that direct sunlight that you often find outdooors. But I like the view, and the food, and the late night games of Spoons, Russian Rummy, Hearts, etc. And finding what humidity-bloated paperback best-sellers come stocked with the house. And what unusual items the kitchen drawer holds, and the annual search for which switch controls the ceiling fan, and renting bikes with my daughters, and finding revolting yet interesting items that've washed up on the beach, and the late-night beach strolls, which are always enlivened by trying to avoid all those tiny, scurrying ghost crabs, and seeing the moon rise. It's all good. Like I said, this is from last June, when the Almanack celebrated its tenth anniversary. So here we are at the eleventh. I'm not sure what the correct gift is for an Eleventh Anniversary, but I think it's gas. Please leave your gifts of a gallon of gas in the driveway, betweeb the van, the station wagon that doesn't work and the garage. Thank you. This is all true! At least, the part about carbon dioxide pumping up vines. If you doubt it, swing by my yard some time. Bring a scythe. I've never been to a college graduation, but I've been to lots off high school graduation. Well, six maybe. And I can't remember a word from any of the speeches. Here's today's. It's two weeks till summer and the DC area is already under a heat advisory, so I rushed this into print. And here's one from I think last year. I only vaguely remembered it and didn't find it till after I'd already done the one for today. I can't say the new one's any improvement over the older one. But nothing else is getting any better, so why should I? Plus, it's too hot to work, even if you're working in a basement studio where the temperature never climbs above 70 degrees. HeroesCon is only two weeks away, so I'm confident youall have made your travel arrangements for the trip to Charlotte NC. It's three days jam-packed full to the brim with comics fun, and you'll kick youself to the curb if you miss it! That may be their official slogan. 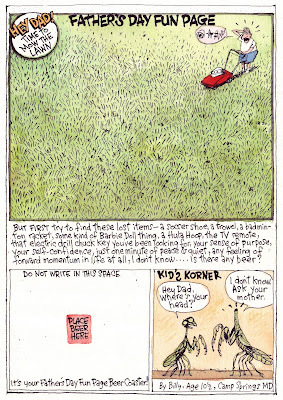 The first great newspaper comic strip of the 21st Century has arrived, and like Mutts and Calvin & Hobbes before it, Richard Thompson's Cul De Sac has spent its first several months in syndication operating just underneath the pop-cult radar, adding papers steadily, readying to break out into the Next Big Thing. 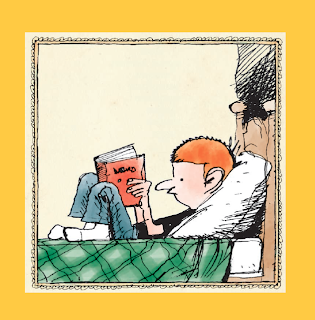 Join Tom Spurgeon for a wide-ranging discussion about art, caricature, and the Otterloop Family with one of the best cartoonists in North America, bar none. It's the panel you'll get to brag about attending in the years ahead, after Thompson conquers the comics world. Frankly, it sounds like the manifesto of a madman to me and I'll be sitting in the back of the room, near an exit, where it's safe. How many great moments in American literature can you identify? The winner will get his or her name mentioned in the exclusive comments section of one of our luxuriously appointed blog posts. Probably this very one. Instead of posting that awful deadline clown again, here's a cow. It's a deadKINE, if you're up for a crummy pun, and who isn't on a Wednesday? This was another Why Things Are illo, and if I recall it ran in tandem with a drawing called something like Why are flies so cute?, the joke being that I had comically mixed up babies and barn flies, those being the subjects for that week. I'm still waiting for the laughter to start on that one. But that's the best cow I've ever drawn, and I've been trying to draw cows for over forty years.